Wish you all a very Happy Lohri!! For those, who are not aware about these festivals, let me brief them about both. 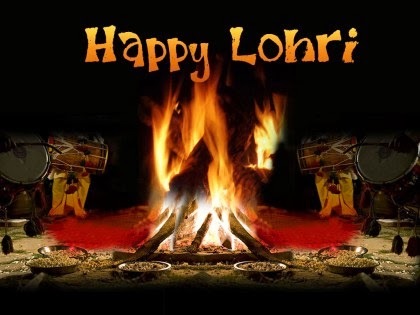 Lohri is a popular festival of Punjabis people, particularly of Sikh and Hindu faith. This festive day signifies the beginning of longer days and is traditionally associated with the harvest of rabi crops. Makar Sankranti is a very auspicious occasion for Hindus all over India and outside and it is basically a harvest festival. This day is said to mark the arrival of spring season and is celebrated on 14th January. Basically, both the festivals have same concept and spirit but they are named differently and celebrated differently with different customs in different parts of world. Now, I plan to start my celebrations with you all my beautiful friends, with some virtual sweets and an eotd with all harvest colours incorporated into it – Green, Yellow, Golden….. I hope you will like the look!! You play with colors sooo Beautifully :* – Its another Gorgeous eye make-up 🙂 Love ! Charu, the eye make up looks so great !! That its a pretty cool eye makeup it looks beautiful well done doll. Gorgeous make up doll, I like green too! It seems difficult to do ! !but it is amazin'! 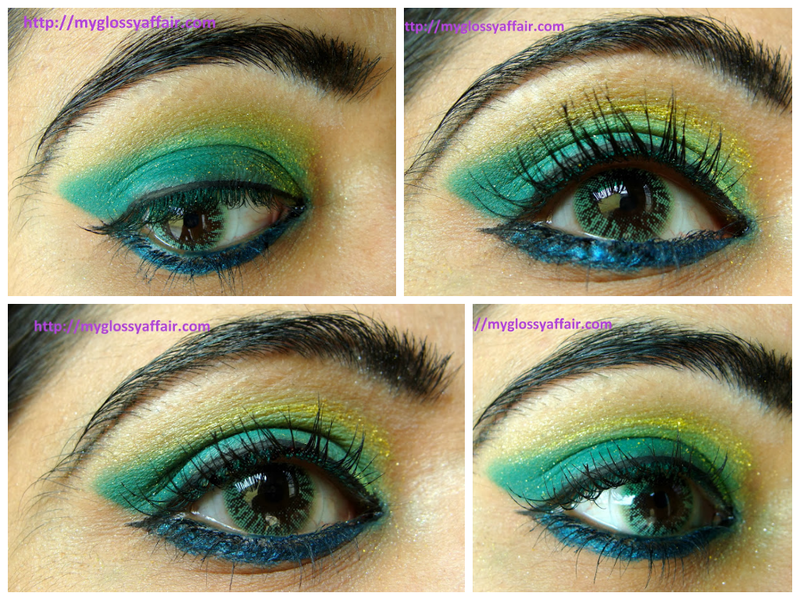 as always…gorgeous eotd! u also have watery eyes like me…. Thats beautiful! love your eyes! Nice. I love the eyes. Happy holiday. Oh my gosh! What amazing make up sweetie! I love the green shade. This sounds like a great celebration to me, I am so ready for longer days! Nice post, great colors, Thanks for the comment. Yes, I would love to follow each other! I do not think these bright colors would look good on me, but you look fabulous! great look yet again!! Have a good week!!! and my g+ for your post!!! Love the make up! so cute. thanks for the visit! Bold and stunning…I love it!! This eye makeup is gorgeous! Happy Makar Skranti Charu! The look is veryyy colorful and pretty. You have beautiful eyes love! Hello dear 🙂 great make up!!! I will follow u gfc, g+ and boglovin;) and now I follow you on facebook too with pleasure! Beautiful make up! I love those colour! hi, thank you for visiting my blog, you have a nice blog too! I follow you bloglovin,facebook, gfc and g+, will you follow me on the same channels? thank you! Lovely shades and perfectly done. Following on bloglovin, twitter and blogger. Please do the same. The lush green shade looks absolutely fascinating! Thank you for you visti on my blog, and lovely comment. I follow you via GFC, G+ and FB. Please follow me back. What amazing make up, dear!!! Wowww.. stunning make up!! lovely blog hun..
Great make up dear, I'm impressed! wooow – this is great!!! 🙂 really love it!! Really bold and pretty makeup! Oh my!!! This looks so gorgeous!!!! Wow! Super choice! Love your look! Wow! I love these eyes! This makeup is very flattering on your beautiful eyes! Thank you for visiting my blog" I've been following your blog for the GFC,you can follow my blog too? those eye looks are so pretty! thanks for your comment. following you via bloglovin. Omgsh how did I miss this one ! Such a stunning look and incredibly beautiful ! I love this gorgeous, bold look! I am now following you on bloglovin babe, and would love for you to follow me back! Thanks for stopping by my blog hun! Loving the smoky eyes! Thanks for your comment on my blog. Sure, I'd love us to follow each other. Let me know what platforms you follow me on and I'd reciprocate the follow. Thank you.